FRANKFORT, Ind. – The Northwestern Lady Tigers entered the IHSAA postseason as the team to beat in Class 3A. Not only have they been ranked No. 1 the entire season, John Harrell’s website gave the squad a 92.4-percent chance to win the Frankfort Sectional and a 50.4-percent chance to win the state title. After outscoring its competition 244-64 in three Class 3A Sectional 20 games, consider the Lady Tigers focused on the task at hand. Northwestern cruised through its three games at Case Arena by knocking off Western 94-12 and Peru 83-21 before dispatching the Lady Red Devils in easy fashion. Being large favorites in the first round of the postseason, head coach Kathie Layden said it was important for her squad to maintain its intensity and not take the wins for granted. The fast-paced offense, coupled with a strong defense, allowed the Tigers to jump to a commanding 22-5 lead after the first eight minutes. By halftime, they led 39-15 and had the game in hand. The big three of sophomores Madison Layden and Kendall Bostic along with junior Taylor Boruff again led the charge as all three were in double figures scoring by halftime. By the time the final horn sounded, Madison Layden had game-highs of 21 points and eight steals while also adding seven rebounds and five assists. Bostic posted a double-double of 14 points and 12 rebounds while Boruff dropped in 14 points on 6 for 9 shooting. Sarah Vas added seven points and Stephanie Burns grabbed six rebounds. Bostic said she was excited to win a second sectional, but she understands this is just one step. 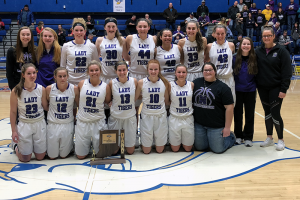 The win was the second consecutive sectional title for Northwestern and the sixth in team history, joining titles in 2000, 2002, 2003 and 2008. An interesting note is Layden, Bostic, Mercer and Klair Merrell have now been teammates on four consecutive IHSAA sectional championship squads – 2017 girls basketball, 2017 girls tennis, 2017 volleyball and 2018 girls basketball. The top-ranked Lady Tigers (25-1) take the next step in the journey on Saturday when they battle No. 14 Mishawaka Marian (21-4) in the 11 a.m. game of the Twin Lakes Regional; game two features Knox (21-4) and Gary West (17-7) with the winners meeting at 8 p.m.
Class 4A Sectional 7: The Kokomo Lady Wildkats ended its season with a 70-48 loss to North Central Conference rival Lafayette Jefferson in the semifinals (Kokomo drew a bye). Kokomo ended its first year under head coach Troy White with a 6-17 record. Class 2A Sectional 39: Eastern played solid basketball in the sectional, losing to perineal favorite Tipton 50-37 in the championship game. The Lady Comets started the tourney with a 35-33 win over Madison-Grant and then topped cross-county rival Taylor 51-43 in the semifinals. Eastern senior Hailey Holliday ended her solid career with 1,228 career points, which is second most in Lady Comets history (Brittany Neeley leads the list with 1,341) and 13th most on the Howard County girls list. Earlier this year, she became the sixth member of the Lady Comets 1,000 Point Club and the 37th in county history.